We are always available for you. We are committed to serving our client to our best ability and we are always available for you. We get back to people. No one like to be ignored. And we are proud of ourselves of getting back to people, all the time, in the shortest possible time frame. We will always keep you updated. We will always get back to you regarding the progress of your concern, even if there’s no progress. So, you can be assured that you’re in the know, and will not be hanging out in the air, not knowing what’s happening. We conduct a thorough research of the comparison of your property to make sure you’re well- informed hence maximising the result. We conduct regular rent review as per allowed, to make sure you’re getting the optimum return for your investment. We are very good at negotiating, making sure that all parties involves are getting the best possible outcome. We armed ourselves with the up to date regulations and changes all the time. Meaning you’re given the latest and up to date news and regulations in order to make the best decision. We are a family own business, and our clients are really important to us. And, when we promised, we will get it done. You can be assured that you’re well looked after. Our record keeping is neat, and you can even log on your own account to check your statement and the performance of your investment property anytime. Buying a property through Chen & Tan means that you are in the hands of professionals who will consistently go out of their way to meet your needs and expectations. At Chen & Tan, selling real estate is our specialty and we love to impart our expert knowledge and work towards a result you will love. Leasing your property with Chen & Tan will save you time and stress, whilst giving you the confidence that your property is in the best possible hands. 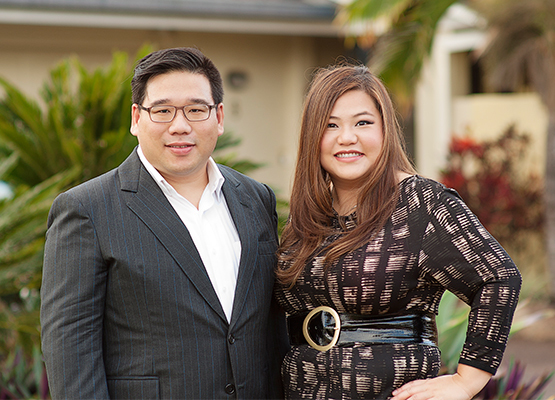 Chen & Tan Real Estate is a real estate agency founded in 2015 by husband and wife, Johnno Chen & Riche Tan, hence the name Chen & Tan Real Estate. Johnno and Riche take their profession seriously and have a lot of pride in their work, from selling property to managing properties. After working in different major and small agencies in different spectrum, from residential sales to property management to project marketing; in mid-2015 they have decided, it’s time to start their own. I would like to thank you both for the wonderful support you provided for my parents and for my sister and myself in selling my parent’s house in Robertson. As you are aware trying to organise this from interstate, while my father was ill, was extremely stressful. However Riche and Johnno, you went above and beyond in the service you provided for our family. As my sister and I were not familiar with the area you were able to put us in touch with capable service providers, from carpet cleaners to pool inspectors. I really felt that you supported us through the whole process. When my husband and I were wishing to sell our unit last year we approached Johnno and he agreed to sell it for us. Rob was not well but with Johnno’s help he was able to see through with the transaction when the time came. The quality of service Johnno provided was excellent. His dealings with our tenant (whom we had for twenty years) were most appreciated. He went the extra mile and found her alternate housing. The price he was able to obtain was very satisfactory and I would certainly recommend Johnno and Riche as agents to anyone I know. Riche and Johnno really care about their clients. They negotiated our deal for over 2 weeks, and have guided us throughout the process making sure that we’ve cross all the ‘T’s and dot the ‘I’s. You were always calm, helpful and cheerful. I particularly appreciated the way in which you dealt with my parents, caring and respectful but never condescending. I wish you both the very best in your business venture and would be more than happy to recommend you to anyone looking for an agent in Brisbane. To Riche and Johnno, very glad we have found you to be our property manager. You keep on top of all issues and follow ups, and providing with up to date reports. We can always discuss with you on every aspect of our property management. You are attentive and go the extra mile for good results, giving us a peace of mind. Thank you for your wonderful service! I love dealing with Johnno & Riche, they know everything about real estate and always give me the best solutions. We keep the CPR approach close to our heart. Communication, Performance & Reliable. Subscribe to our email list and stay up-to-date with all our latest property market information.